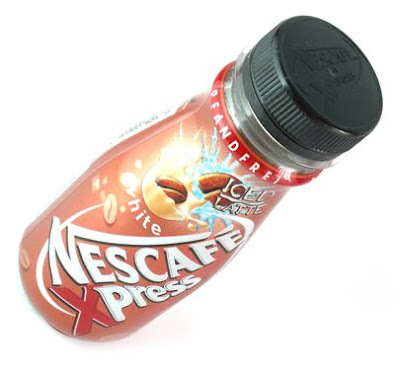 Nescafé Xpress Ice Coffee only available in Germany and the United Kingdom. My favorite drink directly cause I already drink the Nescafé ice coffee in Hong Kong which exist for a quite while already. And now it's finally coming to the rest of the world. I really like ice coffee and it just taste great and nice to drink when the weather is warm instead of drinking hot coffee with a warm weather. Some people think cold coffee is a wrong concept or disgusting when they think about it, but mostly they are people who have not drank Nescafé ice coffee yet and had drunk ice coffee from some cheap brand. I am really someone who want to promote ice coffee into the world. The bottle uses a shrink warp to color the bottle. The shrink wrap is transparent and it have a base printed with silver first on the shrink wrap, to give that metallic brown effect. And then printed with white, brown, black, red and blue.